Are you looking for a great e-commerce solution? Why not try PrestaShop? You can build your online store using this fast, efficient, easy-to-use, and free solution together with Verotel FlexPay. Verotel now provides a free, easy-to-install plugin for PrestaShop, available here. Verotel FlexPay offers an alternative to Verotel’s traditional subscription method of online payments. It allows you to bill for online content, without the need for a subscription. Ever needed to extend the memberships of some of your subscribers? Or wanted to reward them with a few extra days? Now you can! We have just added this feature to the Verotel Control Center. 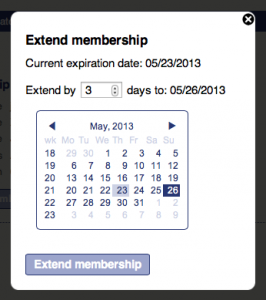 You can now add extra days to a selected active membership. The button to do so is located on the Sale detail pages.